Here is our first roll. 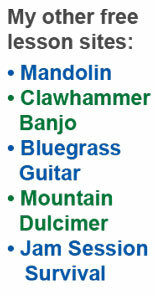 Most banjo tunes will use rolls with eighth notes per measure. Notice that in this roll the first four notes are exactly the same as the second four notes. This will not always be the case. Here is a little free video lesson showing the Thumb In and Out roll. 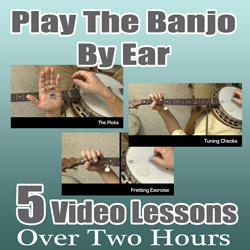 These 5 video lessons (over 2 hours total) might be just the thing to make it all "click" for you. I have discovered that not everyone's brains operate the same way. 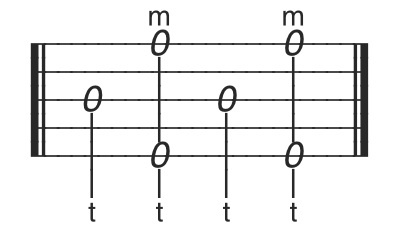 For some people, especially in the early stages of learning, printed tab and chord charts just looks like "chicken scratchin'" and TAB just gets in the way of learning. These videos are a "monkey see, monkey do" method and you should try it and see if it works for you.